The sound is what sets the Folk Alliance International apart from most other business conventions. You couldn't take a step without tripping over a guitar picker, fiddler or folk dancer, not to mention the singer-songwriters who lined the tradeshow hallways. Among the musicians attending this year was Danny Barnes, who flew several thousand kilometers to Memphis from his home in Washington state just to play two short sets. When asked if he was trying to bring his music to people that may not be all that familiar with his work, he replied, "There are a whole lot of people who fall into that category, so the odds [of that happening] are pretty good. For me, a lot of this conference is that I get to see my friends that I don't really see any other time, except at events like this. And it's good to hear some cool music. I always find things, and hear things that I wasn't aware of, and that's always a real treasure, I think." But for the performers and business people who gathered in Memphis, there's more to the conference than just listening to music. 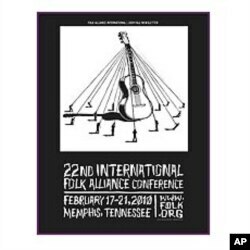 Attending Folk Alliance requires an investment of not just their time, but the cost of traveling to Memphis, and purchasing a conference registration, hotel rooms and meals. At a time when the economy is causing many businesses to cut budgets, conference attendance was up this year. "There are about 200 more [attendees], said Louis Jay Meyers, Executive Director of Folk Alliance International. "I think we were 1,700, and 1,900 this year." At a time when most industries are not seeing growth like that, it is a pretty good boom. "It's fantastic," he continues. "And not only are we seeing it in the conference, we are seeing membership growth in, I think, 16 of the last 18 months. And the membership growth isn't necessarily conference-driven, because there's no reason for someone to join off-season, unless they're doing it to really to be a member. So it's great, we've gone up almost 500 members in six months." And, why would that happen? "I think it's multi-part," Meyers said. "Some of it is the sense of community that people are looking for. They really want to be with kindred spirits, and they want to feel like they're a part of the bigger picture that is really, truly theirs. The other thing is that people want to work. And we have more buyers per capita than any other conference does, except for maybe APAP [Association of Performing Arts Presenters]. But as far as the type of artists and companies we work with, it's a wonderful music market. And especially this year, the international market has really picked up. 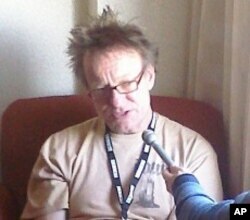 I'm seeing countries here that we've never seen at Folk Alliance before, and organizations from around the world." One of the Folk Alliance's missions in the preservation and growth of folk music is promoting and developing new talent. Each year, hundreds of musicians, most of them unknown, are chosen to perform at the event. All are noticed, but each year, a few artists develop a "buzz" that means everyone is talking about them. Among the "buzz" artists this year is 21-year-old John Fulbright from Okemah, Oklahoma, hometown of folk icon Woody Guthrie. John is now gearing up to make his first studio recording. He's already released one disc, a concert recording, "Live At The Blue Door." While the nights of Folk Alliance are filled with music showcases, days are filled with meetings and seminars, just as they are at any business conference. The only difference is that Folk Alliance panels have a musical bent. "I didn't define the panel tracks on paper, but in my planning pages, there are tracks for traditional music, there's tracks for do-it-yourself," said Louis Jay Meyers. "There's a track called "deep thought" that's really to talk about bigger issues and future world." Of course it's not only unknown new performers who are playing at Folk Alliance International. 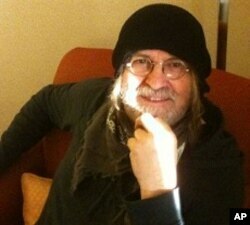 Ray Wylie Hubbard released his first album in 1971. Thirty-nine years later, he's an elder statesman of the Texas music scene, and his latest release with the clever title of "A. Enlightenment B. Endarkenment (Hint: There is No C)", is atop the Americana album chart. The collection is home to 12 original songs, including "Drunken Poet's Dream."